is that he might spend thirty dollars on this. 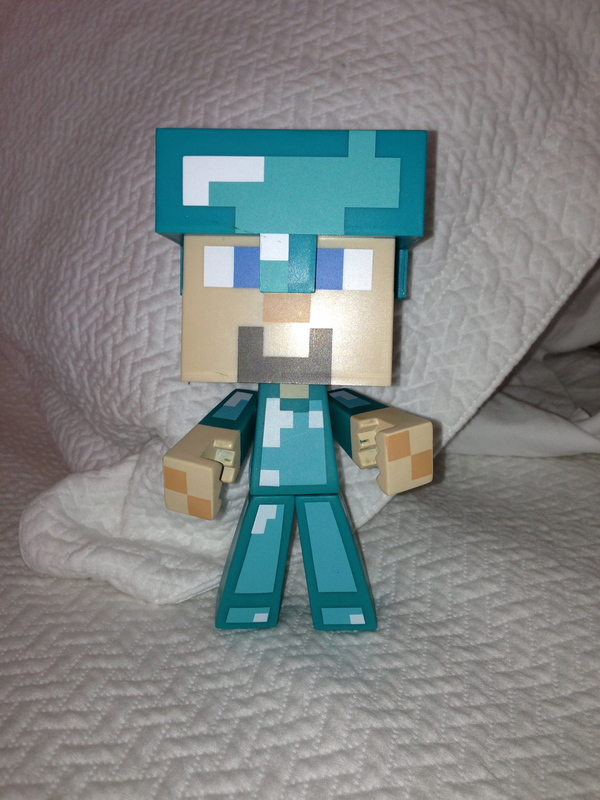 Steve is a Minecraft figure, and has been the object of Ethan’s desire for the past two months. I am not still not sure what Minecraft is, but I know it has something to do with the many hours my son spends hunched over the iPad while I, myself, am hunched over facebook, yelling “just a few more minutes on that game, buddy” every now and then to make us both feel better. Steve does not do anything. He does not make noise. He does not shoot lasers. He is not a good snuggler. Steve simply stands six inches tall. And he cost Ethan thirty dollars. Meaning that, over the last few months, Ethan has stockpiled his meager allowance and finally saved up enough to buy this non-toy. We told him he could spend it on anything he wanted, since his sisters get that privilege on occasion as well. But we did not foresee Steve–the tiny, silent, immoveable, non-action action figure that cost thirty dollars. But Ethan wanted Steve. He begged us to let him spend his hard-earned(ish) money on Steve. He passionately reminded us that we promised him he could spend the money how he chose. Yes, we had promised him. What could we do? We got online and ordered Steve. Typing in $39.95 in the “amount due” box, I pushed the lump in my throat down by assuring myself that when Steve arrived in the mail, he’d be somehow bigger or brighter or better. He stood six inches tall and did absolutely nothing. Except stand on Ethan’s desk and, according to Ethan, “protects him” at night. And although Ethan “paid me back” with thirty one-dollar bills, that $39.95 for this six inch piece of plastic still came out of my checking account. Somebody over at Minecraft is laughing at me. Previous Article Nicholas Sparks comes to Downton Abbey.